The Falcons traded their sixth-round selection (No. 193) to the Tennessee Titans in exchange for guard Andy Levitre and a future undisclosed selection. They subsequently acquired Pick No. 195 from the New York Jets. Falcons players at training camp, July 2016. The Falcons preseason opponents and schedule were announced on April 7, 2016, the opponents being the Washington Redskins, Cleveland Browns, Miami Dolphins and the Jacksonville Jaguars. TB – Roberto Aguayo 43-yard field goal, 9:57. Buccaneers 3–0. Drive: 7 plays, 37 yards, 3:02. ATL – Matt Bryant 34-yard field goal, 7:13. Tied 3–3. Drive: 5 plays, 59 yards, 2:44. ATL – Mohamed Sanu 5-yard pass from Matt Ryan (Matt Bryant kick), 0:16. Falcons 10–3. Drive: 4 plays, 18 yards, 2:20. TB – Brandon Myers 4-yard pass from Jameis Winston (Roberto Aguayo kick), 10:31. Tied 10–10. Drive: 9 plays, 75 yards, 4:46. ATL – Matt Bryant 34-yard field goal, 1:50. Falcons 13–10. Drive: 7 plays, 45 yards, 3:14. TB – Charles Sims 23-yard pass from Jameis Winston (Roberto Aguayo kick), 0:24. Buccaneers 17–13. Drive: 10 plays, 75 yards, 1:31. TB – Austin Seferian-Jenkins 30-yard pass from Jameis Winston (Roberto Aguayo kick), 13:02. Buccaneers 24–13. Drive: 4 plays, 75 yards, 2:06. TB – Mike Evans 45-yard pass from Jameis Winston (Robert Aguayo kick), 5:21. Buccaneers 31–13. Drive: 7 plays, 92 yards, 3:16. ATL – Julio Jones 25-yard pass from Matt Ryan (Matt Ryan–Mohamed Sanu pass), 1:42. Buccaneers 31–21. Drive: 9 plays, 71 yards, 3:37. ATL – Matt Bryant 29-yard field goal, 4:59. Buccaneers 31–24. Drive: 11 plays, 49 yards, 4:54. ATL – Matt Bryant 21-yard field goal, 11:58. Falcons 3–0. Drive: 11 plays, 88 yards, 4:55. OAK – Latavius Murray 1-yard run (Sebastian Janikowski kick), 7:51. Raiders 7–3. Drive: 7 plays, 91 yards, 4:07. ATL – Julio Jones 21-yard pass from Matt Ryan (Matt Bryant kick), 4:46. Falcons 10–7. Drive: 10 plays, 75 yards, 3:05. ATL – Matt Bryant 20-yard field goal, 0:38. Falcons 13–7. Drive: 4 plays, 7 yards, 0:55. OAK – Clive Walford 31-yard pass from Derek Carr (Sebastian Janikowski kick), 11:17. Raiders 14–13. Drive: 8 plays, 81 yards, 3:43. ATL – Jacob Tamme 14-yard pass from Matt Ryan (Matt Ryan run), 3:42. Falcons 21–14. Drive: 5 plays, 85 yards, 1:54. OAK – Michael Crabtree 2-yard pass from Derek Carr (Sebastian Janikowski kick), 12:00. Tied 21–21. Drive: 13 plays, 75 yards, 6:42. ATL – Justin Hardy 13-yard run (Matt Bryant kick), 9:29. Falcons 28–21. Drive: 6 plays, 75 yards, 2:31. ATL – Tevin Coleman 13-yard run (Matt Bryant kick), 4:35. Falcons 35–21. Drive: 5 plays, 50 yards, 2:37. OAK – Andre Holmes 6-yard pass from Derek Carr (Sebastian Janikowski kick), 2:12. Falcons 35–28. Drive: 8 plays, 75 yards, 2:23. NO – Coby Fleener 2-yard pass from Drew Brees (Wil Lutz kick), 8:25. Saints 7–0. Drive: 11 plays, 75, yards, 6:35. ATL – Tevin Coleman 2-yard run (Matt Bryant kick), 5:21. Tied 7–7. Drive: 3 plays, 11 yards, 0:52. ATL – Devonta Freeman 13-yard pass from Matt Ryan (Matt Bryant kick), 14:53. Falcons 14–7. Drive: 11 plays, 74, yards, 5:08. NO – Michael Thomas 3-yard pass from Drew Brees (Wil Lutz kick), 9:55. Tied 14–14. Drive: 12 plays, 75, yards, 4:58. ATL – Tevin Coleman 2-yard run (Matt Bryant kick), 5:31. Falcons 21–14. Drive: 11 plays, 75 yards, 4:24. ATL – Justin Hardy 4-yard pass from Matt Ryan (Matt Bryant kick), 0:28. Falcons 28–14. Drive: 8 plays, 94, yards, 1:23. NO – Wil Lutz 57-yard field goal, 0:00. Falcons 28–17. Drive: 7 plays, 36 yards, 0:28. ATL – Tevin Coleman 6-yard run (Matt Bryant kick), 12:03. Falcons 35–17. Drive: 6 plays, 75 yards, 2:57. NO – John Kuhn 3-yard run (Mark Ingram Jr. run), 7:38. Falcons 35–25. Drive: 9 plays, 75 yards, 4:25. ATL – Matt Bryant 21-yard field goal, 2:58. Falcons 38–25. Drive: 11 plays, 76 yards, 4:40. ATL – Deion Jones 90-yard interception return (Matt Bryant kick), 13:37. Falcons 45–25. Drive: 9 plays, 64 yards, 4:21. NO – Mark Ingram Jr. 5-yard pass from Drew Brees (Wil Lutz kick), 10:00. Falcons 45–32. Drive: 7 plays, 75, yards, 3:37. ATL – Jacob Tamme 4-yard pass from Matt Ryan (Matt Bryant kick), 7:14. Falcons 7–0. Drive: 8 plays, 71 yards, 4:19. ATL – Devonta Freeman 13-yard run (Matt Bryant kick), 0:17. Falcons 14–0. Drive: 6 plays, 98 yards, 3:33. CAR – Kurt Coleman 8-yard interception return (Graham Gano kick), 11:31. Falcons 14–7. ATL – Matt Bryant 28-yard field goal, 5:56. Falcons 17–7. Drive: 10 plays, 65 yards, 5:35. CAR – Graham Gano 54-yard field goal, 3:07. Falcons 17–10. Drive: 6 plays, 39 yards, 2:49. ATL – Austin Hooper 42-yard pass from Matt Ryan (Matt Bryant kick), 9:13. Falcons 24–10. Drive: 10 plays, 99 yards, 5:47. ATL – Aldrick Robinson 35-yard pass from Matt Ryan (Matt Bryant kick), 4:57. Falcons 31–10. Drive: 9 plays, 92 yards, 3:19. ATL – Matt Bryant 53-yard field goal, 13:19. Falcons 34–10. Drive: 10 plays, 36 yards, 5:17. CAR – Kelvin Benjamin 6-yard pass from Cam Newton (Cam Newton run), 11:42. Falcons 34–18. Drive: 5 plays, 63 yards, 1:37. CAR – Greg Olsen 14-yard pass from Derek Anderson (Derek Anderson–Greg Olsen pass), 3:58. Falcons 34–26. Drive: 9 plays, 94 yards, 5:23. ATL – Julio Jones 75-yard pass from Matt Ryan (Matt Bryant kick), 3:45. Falcons 41–26. Drive: 1 play, 75 yards, 0:13. CAR – Corey Brown 16-yard pass from Derek Anderson (Graham Gano kick), 1:53. Falcons 41–33. Drive: 11 plays, 75 yards, 1:52. ATL – Robert Alford 30-yard interception return (Matt Bryant kick), 1:14. Falcons 48–33. Matt Ryan and Julio Jones made Falcons team history as Ryan exploded to 503 passing yards and Jones caught twelve passes for 300 yards and a touchdown, becoming the first quarterback-receiver duo to break 500 passing yards and 300 receiving yards in club history and the first such tandem in the NFL's Super Bowl era. Cam Newton was knocked out of the game with a concussion incurred on a two-point conversion run. ATL – Devonta Freeman 1-yard run (Matt Bryant kick), 11:18. Falcons 7–0. Drive: 9 plays, 75 yards, 3:42. ATL – Matt Bryant 46-yard field goal, 4:23. Falcons 10–0. Drive: 8 plays, 44 yards, 4:23. DEN – Brandon McManus 35-yard field goal, 11:39. Falcons 10–3. Drive: 10 plays, 40 yards, 3:54. ATL – Matt Bryant 33-yard field goal, 1:48. Falcons 13–3. Drive: 17 plays, 77 yards, 7:00. ATL – Tevin Coleman 31-yard pass from Matt Ryan (Matt Bryant kick), 7:53. Falcons 20–3. Drive: 3 plays, 42 yards, 2:01. DEN – Brandon McManus 46-yard field goal, 11:01. Falcons 20–6. Drive: 8 plays, 22 yards, 3:59. ATL – Matt Bryant 25-yard field goal, 8:20. Falcons 23–6. Drive: 6 plays, 68 yards, 2:41. DEN – Demaryius Thomas 3-yard pass from Paxton Lynch (Brandon McManus kick), 2:38. Falcons 23–13. Drive: 16 plays, 78 yards, 5:42. DEN – Brandon McManus 45-yard field goal, 0:14. Falcons 23–16. Drive: 7 plays, 44 yards, 1:42. SEA – Christine Michael 9-yard run (Steven Hauschka kick), 2:02. Seahawks 7–0. Drive: 1 play, 9 yards, 0:05. ATL – Matt Bryant 33-yard field goal, 8:38. Seahawks 7–3. Drive: 12 plays, 52 yards, 4:37. SEA – Alex Collins 2-yard run (Steven Hauschka kick), 4:32. Seahawks 14–3. Drive: 8 plays, 75 yards, 4:06. SEA – Steven Hauschka 42-yard field goal, 0:42. Seahawks 17–3. Drive: 5 plays, 22 yards, 1:16. ATL – Julio Jones 36-yard pass from Matt Ryan (Matt Bryant kick), 11:01. Seahawks 17–10. Drive: 9 plays, 75 yards, 3:59. ATL – Mohamed Sanu 10-yard pass from Matt Ryan (Matt Bryant kick), 6:11. Tied 17–17. Drive: 8 plays, 79 yards, 3:23. ATL – Levine Toilolo 46-yard pass from Matt Ryan (Matt Bryant kick), 0:17. Falcons 24–17. Drive: 6 plays, 97 yards, 3:27. SEA – Christine Michael 1-yard run (kick blocked), 4:43. Falcons 24–23. Drive: 9 plays, 70 yards, 3:51. SEA – Steven Hauschka 44-yard field goal, 1:57. Seahawks 26–24. Drive: 7 plays, 24 yards, 1:51. SD – Melvin Gordon 2-yard run (Josh Lambo kick), 10:55. Chargers 7–0. Drive: 7 plays, 75 yards, 4:05. ATL – Matt Bryant 42-yard field goal, 6:26. Chargers 7–3. Drive: 10 plays, 51 yards, 4:29. ATL – Matt Bryant 27-yard field goal, 2:34. Chargers 7–6. Drive: 4 plays, 1 yard, 0:56. SD – Josh Lambo 40-yard field goal, 13:29. Chargers 10–6. Drive: 10 plays, 61 yards, 4:05. ATL – Jacob Tamme 17-yard pass from Matt Ryan (Matt Bryant kick), 9:06. Falcons 13–10. Drive: 7 plays, 75 yards, 4:23. ATL – Tevin Coleman 30-yard run (Matt Bryant kick), 6:07. Falcons 20–10. Drive: 4 plays, 50 yards, 1:49. ATL – Adrian Clayborn 5-yard fumble return (Matt Bryant kick), 4:31. Falcons 27–10. SD – Melvin Gordon 3-yard run (Josh Lambo kick), 1:02. Falcons 27–17. Drive: 7 plays, 75 yards, 3:29. SD – Josh Lambo 37-yard field goal, 4:50. Falcons 27–20. Drive: 8 plays, 50 yards, 3:15. ATL – Matt Bryant 31-yard field goal, 13:23. Falcons 30–20. Drive: 13 plays, 62 yards, 6:27. SD – Melvin Gordon 5-yard pass from Philip Rivers (Josh Lambo kick), 5:59. Falcons 30–27. Drive: 15 plays, 75 yards, 7:24. SD – Josh Lambo 33-yard field goal, 0:18. Tied 30–30. Drive: 12 plays, 50 yards, 3:14. SD – Josh Lambo 42-yard field goal, 9:01. Chargers 33–30. Drive: 6 plays, 19 yards, 3:11. 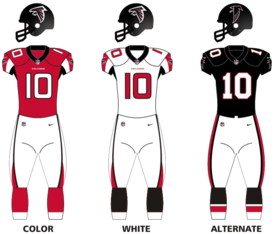 The Falcons wore their black throwback uniforms for this game. With the game tied at 30–30, a missed 58-yarder by Matt Bryant forced the game into overtime. The Falcons received the ball first in overtime but turned the ball over on downs after failing to convert a fourth down. Josh Lambo kicked a 42-yard field goal in overtime to seal a 33–30 victory for the Chargers. ATL – Matt Bryant 36-yard field goal, 9:46. Falcons 3–0. Drive: 10 plays, 57 yards, 5:19. GB – Jordy Nelson 5-yard pass from Aaron Rodgers (Mason Crosby kick), 6:14. Packers 7–3. Drive: 6 plays, 75 yards, 3:33. ATL – Taylor Gabriel 47-yard pass from Matt Ryan (Matt Bryant kick), 5:19. Falcons 10–7. Drive: 3 plays, 71 yards, 1:40. GB – Geronimo Allison 14-yard pass from Aaron Rodgers (Mason Crosby kick), 11:58. Packers 14–10. Drive: 14 plays, 75 yards, 7:35. ATL – Matt Bryant 40-yard field goal, 8:55. Packers 14–13. Drive: 6 plays, 48 yards, 3:01. GB – Trevor Davis 9-yard pass from Aaron Rodgers (Mason Crosby kick), 4:31. Packers 21–13. Drive: 4 plays, 15 yards, 1:24. ATL – Devonta Freeman 5-yard pass from Matt Ryan, 0:32. Packers 21–19. Drive: 8 plays, 75 yards, 3:55. GB – Mason Crosby 29-yard field goal, 0:04. Packers 24–19. Drive: 4 plays, 64 yards, 0:27. ATL – Devonta Freeman 1-yard run (Matt Bryant kick), 3:35. Falcons 26–24. Drive: 14 plays, 80 yards, 7:31. GB – Jeff Janis 7-yard pass from Aaron Rodgers (Aaron Rodgers run), 4:04. Packers 32–26. Drive: 13 plays, 86 yards, 8:33. ATL – Mohamed Sanu 11-yard pass from Matt Ryan (Matt Bryant kick), 0:36. Falcons 33–32. Drive: 11 plays, 75 yards, 3:27. TB – Mike Evans 3-yard pass from Jameis Winston (Roberto Aguayo kick), 9:37. Buccaneers 7–0. Drive: 13 plays, 75 yards, 5:32. ATL – Levine Toilolo 32-yard pass from Matt Ryan (Matt Bryant kick), 7:47. Tied 7–7. Drive: 5 plays, 75 yards, 1:49. ATL – Matt Bryant 29-yard field goal, 6:12. Falcons 10–7. Drive: 4 plays, 3 yards, 0:56. ATL – Matt Bryant 41-yard field goal, 13:42. Falcons 13–7. Drive: 8 plays, 38 yards, 3:02. TB – Mike Evans 24-yard pass from Jameis Winston (Roberto Aguayo kick), 8:43. Buccaneers 14–13. Drive: 2 plays, 24 yards, 0:23. ATL – Taylor Gabriel 9-yard run (Matt Bryant kick), 4:01. Falcons 20–14. Drive: 9 plays, 74 yards, 4:39. ATL – Patrick DeMarco 1-yard pass from Matt Ryan (pass failed), 8:59. Falcons 26–14. Drive: 11 plays, 86 yards, 6:06. ATL – Julio Jones 3-yard pass from Matt Ryan (Matt Bryant kick), 3:07. Falcons 33–14. Drive: 10 plays, 82 yards, 4:52. ATL – Austin Hooper 2-yard pass from Matt Ryan (Matt Bryant kick), 10:00. Falcons 40–14. Drive: 9 plays, 57 yards, 4:43. TB – Adam Humphries 7-yard pass from Jameis Winston (run failed), 6:53. Falcons 40–20. Drive: 11 plays, 75 yards, 3:09. ATL – Matt Bryant 50-yard field goal, 3:47. Falcons 43–20. Drive: 6 plays, 12 yards, 3:05. TB – Cameron Brate 2-yard pass from Mike Glennon (Mike Glennon–Brandon Myers pass), 1:01. "Falcons 43–28. Drive: 11 plays, 75 yards, 2:43. Despite Mike Evans finishing the game with 11 receptions for 150 yards and two scores, the Falcons still managed to beat Tampa Bay on the road, 43–28 in order to go to 6–3. PHI – Ryan Mathews 4-yard run (Caleb Sturgis kick), 4:17. Eagles 7–0. Drive: 12 plays, 81 yards, 7:14. ATL – Matt Bryant 38-yard field goal, 9:36. Eagles 7–3. Drive: 6 plays, 46 yards, 3:04. ATL – Matt Bryant 43-yard field goal, 2:59. Eagles 7–6. Drive: 9 plays, 50 yards, 4:36. PHI – Caleb Sturgis 29-yard field goal, 8:16. Eagles 10–6. Drive: 14 plays, 70 yards, 6:44. ATL – Matt Bryant 46-yard field goal, 4:46. Eagles 10–9. Drive: 8 plays, 47 yards, 3:30. PHI – Caleb Sturgis 25-yard field goal, 13:50. Eagles 13–9. Drive: 10 plays, 59 yards, 5:56. ATL – Taylor Gabriel 76-yard pass from Matt Ryan (kick failed, hit left upright), 13:15. Falcons 15–13. Drive: 2 plays, 75 yards, 0:35. PHI – Ryan Mathews 5-yard run (Ryan Mathews run), 6:49. Eagles 21–15. Drive: 8 plays, 76 yards, 3:36. PHI – Caleb Sturgis 48-yard field goal, 1:57. Eagles 24–15. Drive: 4 plays, 8 yards, 0:22. ARI – Jermaine Gresham 1-yard pass from Carson Palmer (Chandler Catanzaro kick), 9:39. Cardinals 7–0. Drive: 9 plays, 75 yards, 5:21. ATL – Devonta Freeman 1-yard run (Matt Bryant kick), 3:38. Tied 7–7. Drive: 11 plays, 72 yards, 6:01. ARI – Chandler Catanzaro 25-yard field goal, 12:52. Cardinals 10–7. Drive: 11 plays, 68 yards, 5:46. ATL – Matt Bryant 45-yard field goal, 8:30. Tied 10–10. Drive: 9 plays, 48 yards, 4:22. ATL – Taylor Gabriel 35-yard pass from Matt Ryan (Matt Bryant kick), 2:19. Falcons 17–10. Drive: 2 plays, 45 yards, 0:51. ARI – Chandler Catanzaro 54-yard field goal, 0:00. Falcons 17–13. Drive: 4 plays, 27 yards, 0:25. ATL – Tevin Coleman 2-yard run (Matt Bryant kick), 2:56. Falcons 24–13. Drive: 13 plays, 77 yards, 6:05. ATL – Taylor Gabriel 25-yard pass from Matt Ryan (Matt Bryant kick), 8:48. Falcons 31–13. Drive: 10 plays, 60 yards, 5:29. ARI – David Johnson 3-yard pass from Carson Palmer (pass failed), 4:44. Falcons 31–19. Drive: 13 plays, 75 yards, 4:04. ATL – Devonta Freeman 5-yard run (Matt Bryant kick), 2:07. Falcons 38–19. Drive: 6 plays, 46 yards, 2:37. ATL – Devonta Freeman 1-yard run (Matt Bryant kick), 10:02. Falcons 7–0. Drive: 10 plays, 81 yards, 4:58. KC – Spencer Ware 3-yard run (kick blocked), 8:00. Falcons 7–6. Drive: 4 plays, 72 yards, 2:02. ATL – Matt Bryant 22-yard field goal, 5:11. Falcons 10–6. Drive: 5 plays, 71 yards, 2:49. ATL – Matt Bryant 22-yard field goal, 13:25. Falcons 13–6. Drive: 11 plays, 53 yards, 4:26. KC – Spencer Ware 3-yard pass from Alex Smith (Cairo Santos kick), 7:05. Tied 13–13. Drive: 11 plays, 92 yards, 6:20. KC – Eric Berry 37-yard interception return (Cairo Santos kick), 0:37. Chiefs 20–13. ATL – Matt Bryant 59-yard field goal, 0:00. Chiefs 20–16. Drive: 5 plays, 33 yards, 0:37. KC – Albert Wilson 55-yard run (Cairo Santos kick), 12:52. Chiefs 27–16. Drive: 4 plays, 64 yards, 2:08. ATL – Devonta Freeman 1-yard run (pass failed), 11:57. Chiefs 27–22. Drive: 11 plays, 80 yards, 6:12. ATL – Aldrick Robinson 5-yard pass from Matt Ryan, 4:32. Falcons 28–27. Drive: 10 plays, 80 yards, 4:53. KC – Eric Berry defensive two-point conversion, 4:32. Chiefs 29–28. The Falcons trailed 27–16 going into the fourth quarter, and took the lead through a 1-yard touchdown run by Devonta Freeman, followed by a 5-yard pass from Matt Ryan to Aldrick Robinson. Having failed on the two-point conversion following Freeman's touchdown, they tried for two points again after Robinson's catch with the aim of securing a three-point lead going into the last four minutes of the game; however, Chiefs safety Eric Berry intercepted Ryan's attempted pass and returned it all the way to the Atlanta end zone for a defensive two-point conversion that gave Kansas City a 29–28 lead that they were able to defend for the remainder of the game. ATL – Justin Hardy 3-yard pass from Matt Ryan (Matt Bryant kick), 14:50. Falcons 7–0. Drive: 1 play, 3 yards, 0:10. ATL – Tevin Coleman 6-yard pass from Matt Ryan (Matt Bryant kick), 14:53. Falcons 14–0. Drive: 9 plays, 88 yards, 3:05. ATL – Deion Jones 33-yard interception return (Matt Bryant kick), 8:54. Falcons 21–0. ATL – Taylor Gabriel 64-yard pass from Matt Ryan (Matt Bryant kick), 13:18. Falcons 28–0. Drive: 3 plays, 75 yards, 1:42. ATL – Tevin Coleman 6-yard run (Matt Bryant kick), 3:56. Falcons 35–0. Drive: 8 plays, 54 yards, 4:29. ATL – Vic Beasley 21-yard fumble return (Matt Bryant kick), 2:50. Falcons 42–0. LA – Todd Gurley 3-yard run (Greg Zuerlein kick), 14:57. Falcons 42–7. Drive: 8 plays, 60 yards, 2:53. LA – Jared Goff 2-yard run (Greg Zuerlein kick), 2:44. Falcons 42–14. Drive: 13 plays, 80 yards, 4:59. ATL – Devonta Freeman 5-yard run (Matt Bryant kick), 10:31. Falcons 7–0. Drive: 6 plays, 47 yards, 2:57. ATL – Taylor Gabriel 9-yard pass from Matt Ryan (Matt Bryant kick), 7:40. Falcons 14–0. Drive: 5 plays, 50 yards, 1:58. ATL – Austin Hooper 9-yard pass from Matt Ryan (Matt Bryant kick), 0:40. Falcons 21–0. Drive: 11 plays, 55 yards, 5:51. SF – Garrett Celek 16-yard pass from Colin Kaepernick (Phil Dawson kick), 12:45. Falcons 21–7. Drive: 6 plays, 75 yards, 2:55. ATL – Devonta Freeman 9-yard run (Matt Bryant kick), 4:28. Falcons 28–7. Drive: 6 plays, 94 yards, 3:32. SF – Rod Streater 5-yard pass from Colin Kaepernick (kick failed, wide left), 0:13. Falcons 28–13. Drive: 13 plays, 75 yards, 4:15. ATL – Matt Bryant 50-yard field goal, 6:29. Falcons 31–13. Drive: 6 plays, 25 yards, 2:50. ATL – Devonta Freeman 34-yard run (Matt Bryant kick), 1:42. Falcons 38–13. Drive: 4 plays, 77 yards, 2:16. ATL – Matt Bryant 41-yard field goal, 1:09. Falcons 41–13. Drive: 8 plays, 68 yards, 5:06. ATL – Joshua Perkins 26-yard pass from Matt Ryan (Matt Bryant kick), 10:57. Falcons 7–0. Drive: 8 plays, 75 yards, 4:03. ATL – Matt Bryant 51-yard field goal, 6:09. Falcons 10–0. Drive: 5 plays, 12 yards, 2:18. ATL – Matt Bryant 48-yard field goal, 0:35. Falcons 13–0. Drive: 7 plays, 44 yards, 4:03. CAR – Graham Gano 31-yard field goal, 10:17. Falcons 13–3. Drive: 6 plays, 31 yards, 1:32. ATL – D. J. Tialavea 1-yard pass from Matt Ryan (Matt Bryant kick), 5:34. Falcons 20–3. Drive: 11 plays, 75 yards, 4:43. CAR – Graham Gano 40-yard field goal, 9:23. Falcons 20–6. Drive: 13 plays, 53 yards, 5:37. ATL – Matt Bryant 29-yard field goal, 3:34. Falcons 23–6. Drive: 10 plays, 64 yards, 5:49. CAR – Kelvin Benjamin 26-yard pass from Cam Newton (Graham Gano kick), 0:00. Falcons 23–13. Drive: 8 plays, 56 yards, 3:34. ATL – Tevin Coleman 55-yard run (Matt Bryant kick), 13:19. Falcons 30–13. Drive: 4 plays, 75 yards, 1:41. CAR – Graham Gano 31-yard field goal, 9:43. Falcons 30–16. Drive: 11 plays, 62 yards, 3:36. ATL – Matt Bryant 50-yard field goal, 1:55. Falcons 33–16. Drive: 4 plays, 3 yards, 1:45. ATL – Tevin Coleman 7-yard pass from Matt Ryan (Matt Bryant kick), 11:55. Falcons 7–0. Drive: 4 plays, 68 yards, 2:11. NO – Wil Lutz 19-yard field goal, 3:53. Falcons 7–3. Drive: 15 plays, 74 yards, 8:02. ATL – Devonta Freeman 75-yard run (Matt Bryant kick), 3:42. Falcons 14–3. Drive: 1 play, 75 yards, 0:11. NO – Tim Hightower 2-yard run (Wil Lutz kick), 0:52. Falcons 14–10. Drive: 7 plays, 75 yards, 2:50. ATL – Julio Jones 1-yard pass from Matt Ryan (Matt Bryant kick), 14:17. Falcons 21–10. Drive: 4 plays, 75 yards, 1:35. ATL – Mohamed Sanu 10-yard pass from Matt Ryan (Matt Bryant kick), 6:51. Falcons 28–10. Drive: 10 plays, 76 yards, 5:41. NO – Wil Lutz 40-yard field goal, 3:40. Falcons 28–13. Drive: 7 plays, 53 yards, 3:11. ATL – Justin Hardy 7-yard pass from Matt Ryan (Matt Bryant kick), 0:32. Falcons 35–13. Drive: 9 plays, 75 yards, 3:08. ATL – Matt Bryant 22-yard field goal, 5:17. Falcons 38–13. Drive: 14 plays, 95 yards, 5:06. NO – Michael Thomas 14-yard pass from Drew Brees (run failed), 12:41. Falcons 38–19. Drive: 7 plays, 89 yards, 2:11. NO – Mark Ingram Jr. 1-yard run (pass failed), 2:47. Falcons 38–25. Drive: 5 plays, 50 yards, 2:18. NO – Travaris Cadet 3-yard pass from Drew Brees (Wil Lutz kick), 0:39. Falcons 38–32. Drive: 13 plays, 57 yards, 2:08. This was the Falcons' final regular season game at the Georgia Dome. After coming off a first round bye, the Falcons hosted the Seahawks in the divisional round of the playoffs. The Falcons trailed midway through the first quarter when the Seahawks went up 7–0 from a 7-yard touchdown pass from Russell Wilson to Jimmy Graham. In the second quarter, Atlanta tied the game 7–7 on a 7-yard touchdown pass from Matt Ryan to Julio Jones. On the next Seattle drive, the Seahawks took a 10–7 lead with a 33-yard field goal from Steven Hauschka. The next Falcons drive ended in a three and out. On the ensuing punt, Seattle's Devin Hester returned the punt 80-yards to Atlanta's 7-yard line. However, that punt return was called back on a penalty, forcing Seattle to start at its own 7-yard line. After Thomas Rawls was tackled for a 3-yard loss, Wilson attempted to drop back to pass. However, while doing so, Wilson tripped over Rees Odhiambo's foot and was tackled in the end zone, leading to a safety for Atlanta. Receiving the ball following the safety, Atlanta took its first lead of the game on a 35-yard field goal from Matt Bryant. After forcing Seattle to Punt, the Falcons took a 19–10 lead going into halftime on a 14-yard touchdown pass to Tevin Coleman. Atlanta remained ahead for the rest of the game, eventually beating Seattle 36–20. With the win, the Falcons improved their record to 12–5. Matt Ryan threw for 338 yards and 3 touchdowns and improved his playoff record to 2–4, with both of his playoff wins (up to that point) coming against the Seahawks. This was speculated to be the last NFL game ever in the Georgia Dome, but when the fourth-seeded Green Bay Packers upset the top-seeded Dallas Cowboys in the other Divisional Playoff the next day, Atlanta was named the host of the NFC Championship Game, the last ever game in the Dome. This was the Falcons' final game ever in the Georgia Dome after 25 seasons, as the team moved into the Mercedes-Benz Stadium in 2017. The Falcons never trailed in the game, scoring 31 unanswered points until Rodgers threw a touchdown pass halfway through the third quarter to give Green Bay its first points. The Falcons won 44–21 to advance to the Super Bowl for the first time since their 1998 season, as well as the second time in franchise history. Matt Ryan had a big game, throwing 4 touchdown passes and running for another score. His 392 yards were the second-most ever thrown in a Championship Game, only behind his 396 yards in the 2012 NFC Championship Games versus the San Francisco 49ers. Julio Jones was another huge part of the Falcons win, with 9 catches, 180 yards and 2 touchdowns. One of the scores came on a 73-yard tackle-breaking catch. The Falcons' defense held fellow MVP-candidate Rodgers and his offense in check most of the game, forcing several hurries and drops. 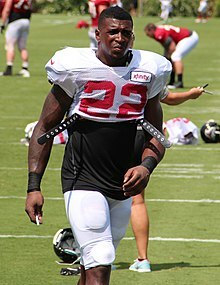 They also forced 2 turnovers, one of them coming on a 3rd and 21 pass by Rodgers, that Ricardo Allen intercepted. The Falcons led the game 28-3 into the third quarter before the Patriots scored 25 unanswered points to tie at 28 all, and create the first Super Bowl game to go into overtime. The Patriots won the coin-toss and won the game via a James White touchdown. This ended the Falcons' season record at 13-6. Chicago, Dallas, Los Angeles and New Orleans was 3–2, while Tampa Bay's cumulative record against the same four teams was 2–3. ^ a b New Orleans finished ahead of Philadelphia based on better record vs. conference opponents. ^ a b Seahawks vs. Falcons play-by-play. January 14, 2017. Retrieved January 14, 2017. ^ a b c Ryan leads Falcons to NFC title game, beating Seattle 36-20. ESPN.com. Retrieved January 14, 2017. ^ "2016 Atlanta Falcons Statistics & Players". Pro-Football-Reference.com. Retrieved 6 August 2017. Wikimedia Commons has media related to 2016 Atlanta Falcons season.